When Metal Goes Acoustic: Disturbed On Covering Simon & Garfunkel The band's Grammy-nominated cover of "The Sound of Silence" seems to come out of left field — until you learn where lead singer David Draiman first cut his teeth as a performer. 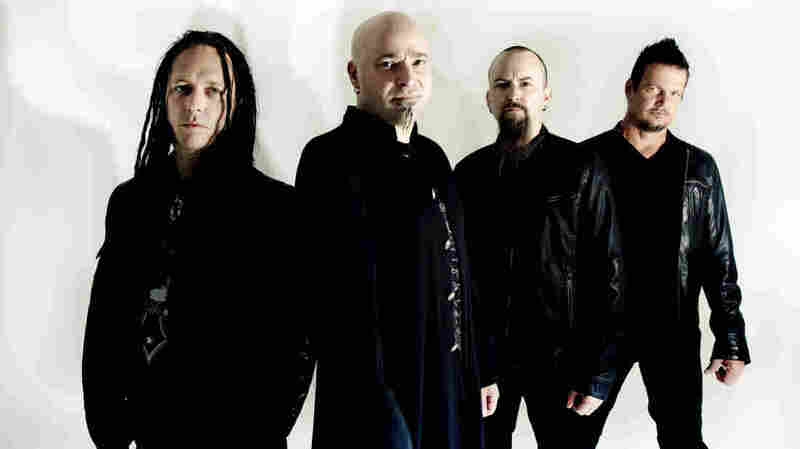 For the band's Simon & Garfunkel cover, Disturbed's lead singer, David Draiman (second from left), utilized the classical vocal techniques he learned at his synagogue as a child. In 2009, the heavy metal band Disturbed received a Grammy nomination for its song "Inside The Fire," a hard-hitting, emotional track delivered with aggressive guitar riffs and raspy singing. Recently, the band received another Grammy nomination, but this time it was for a song with a very different sound: an acoustic cover of Simon & Garfunkel's "The Sound of Silence." Lead singer David Draiman says the band's drummer, Mike Wengren, had the idea: "It had been something that his family had played in the background when it was time to do the chores at home," Draiman says. Once they'd settled on the song, the group's guitar player, Dan Donegan, urged his bandmates to depart from their signature sound in favor of something gentler. Melodic singing wasn't out of the question for Draiman: When he was young, he trained to be a cantor, the singer who leads a Jewish congregation in prayer. "I hadn't attempted to go to that spot of my vocal ability for many years," he says. "Listening to the way my vocals sounded in that beautiful bed of music — and not having heard my voice in that way for so long — it was really just very, very overwhelming." Disturbed's latest album, Immortalized, is out now. Hear more from Draiman at the audio link.